IMAX 3D camera inside space shuttle Atlantis' payload bay during the STS-125 mission. Eight pairs of eyes were trained on the Hubble SpaceTelescope on Tuesday as it was released into orbit after spending a weekberthed in space shuttle Atlantis' payload bay. Seven of those stares belongedto the crew of STS-125, who worked to upgrade the satellite during that time. The eighth captured the view for the rest of us: an IMAX3D camera. The 70 mm camera, best known for producing the largeformat movies that museums and science centers project on giant screens, wasflown on the orbiter to document the fifth and final crewed mission toservice the telescope for "Hubble 3D",to be released by Warner Brothers in the spring of 2010. "The main story is to showcase Hubble and itsfantastic legacy," described Toni Myers, producer and director of"Hubble 3D", in an interview with collectSPACE.com. "It's sort of the life of Hubble." "A big feature of the film will be thisrepair," she added. "This is a bigger threat, a bigger challenge, than Ihad originally thought," admitted STS-125 pilot — and director ofphotography — Greg C. "Ray Jay" Johnson, during a pre-flightinterview with collectSPACE.com. "We only have 8 minutes of tape at 30 seconds awhack, so you can screw this up," he observed. 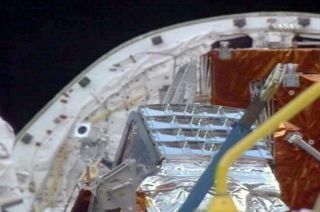 Given weight constraints, a single, compact 3D camera wasflown inside Atlantis' payload bay. Unlike the ground based models that IMAXused to film the crew's training and launch, which employ two rolls of film —one for each "eye" — the orbital version records both left and righteye images on one strip of film. "What that means," explained Myers, "is tomaintain 24 frames a second, it has to go twice as fast. So normal IMAX is 336feet a minute, so this one is running 672 feet a minute." The camera holds 5,400 feet, or one mile, of tape butthat equates to just 8 minutes, and there's no reloading. Myers developed a list of about 40 possible scenes thatJohnson might capture, ranging from the activities during the mission's fivespacewalks to this morning's deploy of the telescope. What she didn't want wereposed shots. "No 'Hello Mom!' kind of scenarios," recalledJohnson. As it turned out, astronauts hamming it up for the camerawas the least of the concerns. Of greater worry was the condition of the cameraand the timing of the key mission events. On the sixth day of the flight, spacewalker Drew Feustelnoticed that the window through which the IMAX camera shot from inside itscargo bay enclosure was fogging up. "Many thanks to Drew for making the catch on thewindow fog," read the Flight Day 7 IMAX team notes that were uplinked tothe crew. "We can't afford to shoot the remaining seconds of film throughfog. Checking for fog... before a scene will prevent this." The daily notes provided other tips for preventing thefog, as well how to better frame and shoot interior crew cabin scenes using HDcamcorders that will be converted post flight to 3D. Mostly though, the team suggested replacement shots asscenes planned for daylight slipped into the night. As the shuttle circles theEarth, it moves in and out of sun every 45 minutes. "You can't plan for that very rigorously except toknow what your back-up is. So every day, I am re-planning if we've lost a shot,how to make it up. It is sort of juggling those 8 minutes," Myers said. "This is the prime shot of the [fine guidancesensor] but it may be threatened by darkness per the re-planned time line. Wevery much want this scene. If in real time you see that the install scene isgoing to be too dark, then we need to shoot the FGS2 removal BEFORE it,"instructed a note before the mission's final spacewalk. Of course, some shots cannot be replaced. Not only wasthe release of the telescope a pivotal moment in history — it was likely to bethe last time astronauts would be within eyeshot of Hubble — it was also theend of the reel. "You should allow the camera to run out on thisone," the note for today began. Elsewhere in their morning mail, the crew was advised toturn on the lights in Atlantis' cargo hold. "Turning on all possiblepayload bay flood lights will increase the chance for successful filming,"the note explained. Continue readingat collectSPACE.com to learn how "Hubble 3D" willtake people to the stars. Copyright 2007 collectSPACE.com. All rights reserved.